Digital disruption is the biggest challenge that businesses are facing today. But where there is risk, there is opportunity. New technologies allow you to think big. At the same time, you need to think practical. Make Disruption Work shows you what digital disruption entails and how to ride the wave. The book is focused on evidence, not opinion, and offers real-world examples of companies that underwent digital disruption and how they now bank extremely healthy digital sales. Disruption need not be a threat: it's a power, and it's in your hands. Jankovich and Voskes founded digital consulting firm SparkOptimus in 2010, because they want to advance society by tapping into the possibilities new technologies bring. As such, they have worked with some of the biggest companies in the world, building their digital capabilities from the ground up. This book is published by SparkOptimus and crystallizes its knowledge. It is practical, demystifying, effective, and endorsed by leading CEOs and business school professors (e.g. Unilever, INSEAD). SparkOptimus is the leading digital growth consultancy and the fastest growing management consultancy firm in Europe. It delivered more than 100 digital projects in the last 18 months in more than 15 markets, e.g. UK, Denmark, Germany, The Netherlands, USA, South Africa, and Australia. It has built its clients’ digital capabilities from the inside and has launched new digital ventures that are now capturing market share and disrupting the disruptors. The firm is also disrupting consulting itself, applying innovative working methods, proprietary models and leading strategic and practical knowledge, and for the last five years straight has enjoyed 70%-a-year growth. This may be a connoisseur's take, but I felt with this book the way I feel about movies by directors I love. It must have had an excellent editor, who really knew who to bring out the best in the writers and the subject matter itself. Digital Transformation is a trite phrase, because it's so widely used by so many businesses, but it really is a deep and necessary topic for most companies to confront. They *have* to adapt to the Internet, they *have* to learn how to automate repetitive tasks with software, and they *have* to stay abreast of current technology so that it doesn't knock them over some day. Look what happened to newspapers! Look what's happening to banks! They are becoming digital or they are dying, and sometimes both at once. Off the bat, I will say I'm well-versed in Clay Christensen's Innovators Dilemma and Innovators Solutions books and I've worked for some of the largest disruptors (Amazon, Google). So the concept of digital disruption is not new to me. That said, I find SparkOptimus' Make Disruption Work directly actionable in presenting simple frameworks (5D model, 5 core capabilities to forge a winning organization, sample P&L dashboard in illustrating KPIs ) to implement within organizations to measure and optimize results and drive further disruption at scale. I also found the 3 case studies at the end of the book to be clarifying in tying it all together. 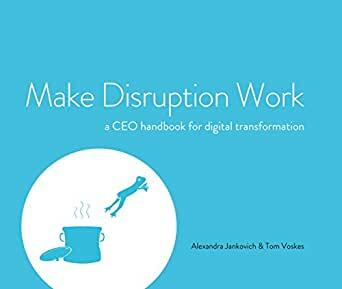 I highly recommend this book if you're looking to implement processes within your organization to help identify and optimize areas for disruption. 5,0 van 5 sterrenInformative and Relevant to Business Today! Informative in general, but the part that really stuck with me was the suggested time investment across three horizons (optimization, transformation, disruption). A clear example of when the authors offer you a useful tool to see whether you are doing the right thing. 5,0 van 5 sterrenSurprisingly practical! Surprisingly practical book on a topic that is often mostly described with a bunch of buzzwords, digital disruption. It facilitates me to make changes to my company in order to improve my business fundamentally, without providing illusions of hacking your way to success with a bunch of shortcuts. 5,0 van 5 sterrenPractical & relevant. Worth checking out. Definitely an interesting read with a practical explanation of digital transformation and a challenge to common thinking about leading a company in today's rapidly ever-changing environment. Also has great information about how to manage data as a company that's useful.